It's hard to believe it's June already! I'll bet all of you are putting in your garden and planting flowers. I wanted to offer my digging services but Mom said "NO!". She says I spend too much time digging up the plants. Weeds, plants, it's all the same to me. It's green and I love to dig! We have a new collection from Northcott in. It's called Knotty Intentions. It has a panel that looks like parquet flooring and coordinating wood fabrics. The light colored bolt on the far right is a Timeless Treasures batik. 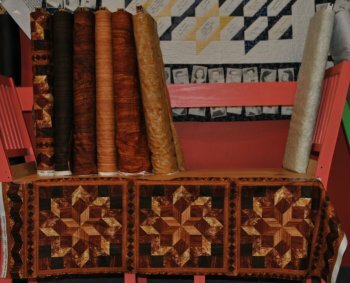 Mom and Grandma ordered some nice fabrics at Quilt Market, including the Barn Quilt panel and coordinating fabrics that a lot of you folks have been looking for. 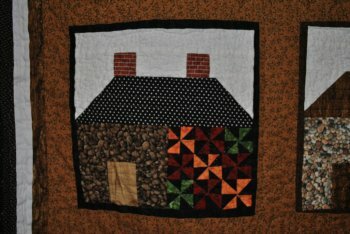 It was being sold as a kit in one of the mail order quilting catalogs. They finally were able to find it for you. It is supposed to be shipped in late June. We are also now able to order Arrow & Kangaroo Kabinets for anyone interested in their products. We have a few pieces here at the Shop and we have brochures available. Grandma wanted a few of the sewing tables and chairs for the Classroom to make it more quilter friendly, we had to become a dealer to get them. Don't forget! 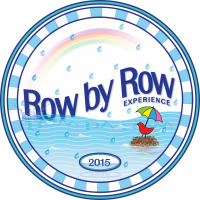 The Row by Row Experience starts June 21st. We are closed on Sundays, we will start on June 22nd. The theme for 2015 is water. We are ready with our Row and we also carry the "Bobbin the Robin" mascot pattern. On to our Show and Tell portion of our newsletter. 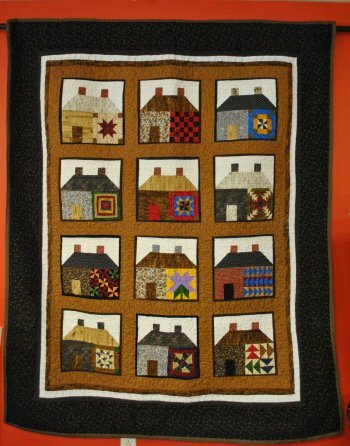 We have had a couple more beautiful quilts come in this past month and we're going to show them off. The original pattern called for all dark fabrics. Maureen decided to lighten and brighten it for her quilt. 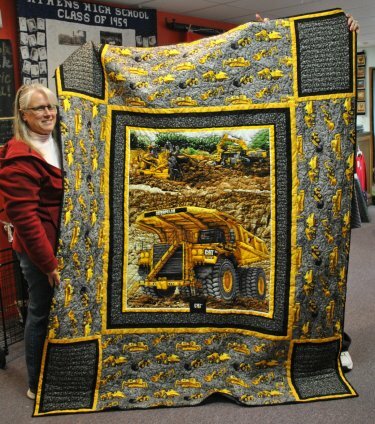 This beautiful quilt was made by Cindy G.
Cindy started with the CAT equipment panel for her center block and expanded from there. We hope you are enjoying our new "Show and Tell" on our newsletter. It's now time for a dip in my swimming pool. 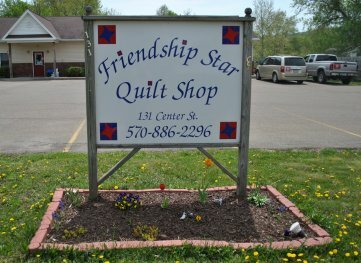 Enjoy the Summer weather and we will see you at the Shop on the rainy days.